This past weekend was the Arisia science fiction convention, which is put on each January by several hundred of my closest friends in Boston, MA. I attended almost every Arisia from 1999 to 2014 (after which I moved back to the Midwest). In 2006, since all my geeky shul friends were attending the convention anyway, I started organizing a Friday night Kabbalat Shabbat service at the convention hotel. Those of us who were on the synagogue board borrowed a large (and heavy!) crate of assorted prayerbooks from Temple Beth Shalom of Cambridge every year to make the service happen. The goal was to produce a complete prayerbooklet for the Friday night Kabbalat Shabbat and Ma’ariv service that was as compact as possible yet user-friendly — with Hebrew, English, and full transliteration. The resulting booklet is designed to be printed on 9 double-sided sheets of 8.5×11″ paper, folded to 5.5×8.5″ and saddle stapled. Since Arisia takes place in mid-January, this “Condensed” edition omits all special insertions for holidays and other times of year. A companion “Expanded” edition which includes insertions for year-round use is still in the works. 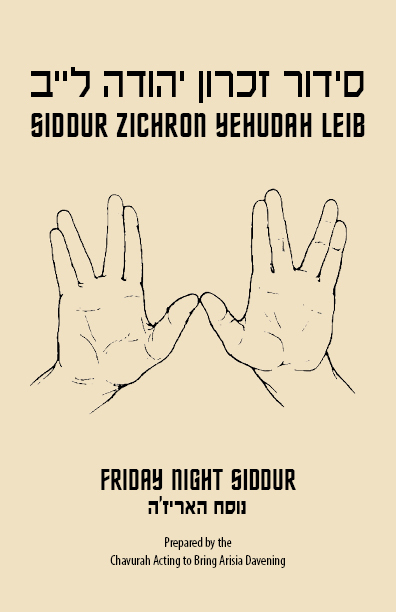 The finished booklet was named Siddur Zichron Yehudah Leib to honor Leonard Nimoy, z”l (1931–2015), whose Hebrew name that was. The siddur made its debut on Friday, January 13, 2017, with 42 people in attendance. 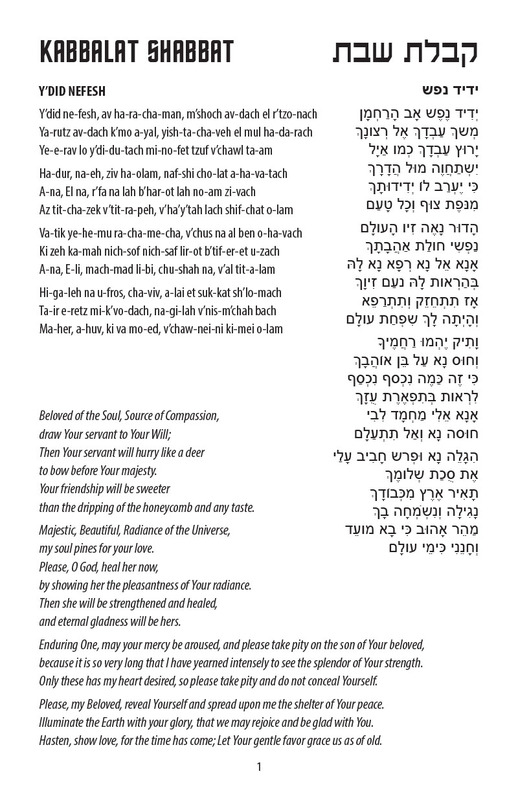 The 36-page reader’s PDF and the InDesign source file are available at this project’s page on OpenSiddur.org. I’ll also be glad to design a custom cover for your group or event, and incorporate it into the printable files. Head on over to my Etsy shop and hit me up. And if you locate any typographical errors or omissions, please let me know in comments.